But large objects (like flowerpots, pedestrian refuges, speed bumps or concrete domes) cost money. And if you want them both permanent and attractive, that’s even pricier. This is why on-street storm drainage can be a great deal for taxpayers and safe streets alike. Slicing holes in the pavement and planting grass in them isn’t cheap either. But in cities that get large bursts of rain, they’re useful for preventing flooding and water pollution, and far cheaper than laying new pipes to carry stormwater away. So if your city’s transportation department and its stormwater management department were to team up to put storm drainage in just the right places, it could be a very cost-efficient way to manage runoff while creating permanent, attractive separation between bike and car traffic. 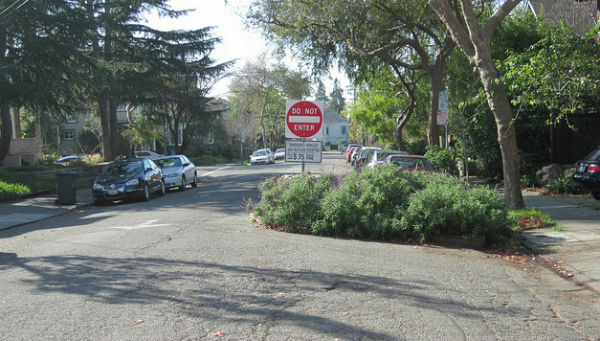 A small storm drainage area can also create an excellent traffic diverter, reducing auto traffic on a bike-friendly side street. Coming in June 2017, the Urban Street Stormwater Guide is a first-of-its-kind collaboration between city transportation, public works, and water departments to advance the discussion about how to design and construct sustainable streets. The Urban Street Stormwater Guide provides cities with national best practices for sustainable stormwater management in the public right-of-way. NACTO has been a major force in advancing common-sense bike infrastructure. Hopefully it can help do the same with stormwater management, to everyone’s benefit. Bioswales are a MUCH smarter approach to managing stormwater than a car-centric “solution” like Chicago’s rain blockers. This system takes a low tech approach by slowing the flow of stormwater into local sewers, which can create an extreme amount of street flooding during and after storms. This may be find if you’re in a car, but it’s a lose-lose for people who are walking, biking or taking public transit. I’ve often had to cross mid-block and take unwanted detours during heavy downpours because the intersections turned into small lakes that were ankle deep or deeper. I’ve had good shoes ruined this way when there were unexpected thunderstorms and the only way to get home involved wading across a flooded street through several inches of murky water. I’ve known people who had significant basement flooding because standing water rose over adjacent curbs and into their basement windows. 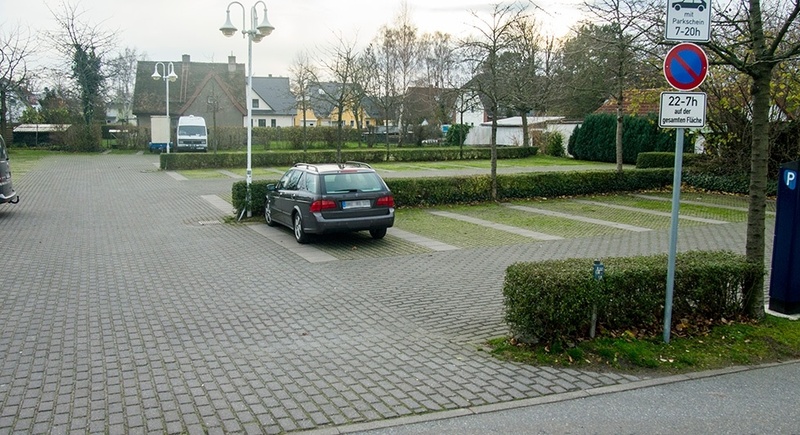 Parking lots should be permeable as well. Looks like the picture from Berkeley is of a landscaped island which has 6″ curbs and doesn’t necessarily allow water to run off the street into the planter. It’s still good for traffic calming, greening, and capturing rain that falls directly onto it, but it’s not the same thing as a bioswale.